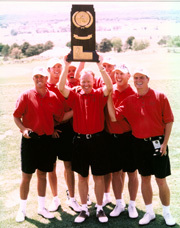 In one of college golf’s most dominating years, the 1997-1998 UNLV Men’s Golf Team took winning to new heights. The Rebels, led by Coach Dwaine Knight, won just about everything in sight in that magical season that culminated with UNLV winning the national championship on the Championship Course at the University of New Mexico, at Knight’s alma mater and in his hometown. The Rebels posted a four-round total of 1,118 (34-under par). That was good enough to beat Clemson by three strokes. Rebels who teed it up for the record-setting victory were Chris Berry (tied for second individually), Bill Lunde (tied for 15th), Charley Hoffman (tied for 20th), Jeremy Anderson (tied for 29th) and Scott Lander (tied for 37th). The scoring total was the lowest in the history of the NCAA Championships. Other members of that team included Daron Dorsey, Scott Wingfield and Christian Thornley. Knight said the season was remarkable because the team won tournaments when they led going into the final round, when they were even and when they trailed. “After not making the cut last year and losing the players we did, for this team to gain the No. 1 spot again, coming in expected to win, and with the pressure, holding on for the victory makes me very proud,” Knight said following the tournament. That season, the Rebels won seven other tournaments: the Golfworld Collegiate Invitational, Bellsouth Yellow Pages Intercollegiate, John A. Burns Intercollegiate, TaylorMade/Waikoloa Intercollegiate, Rolex Match Play Championship and the PING/Golfweek Preview. Hoffman was the first member of that national championship team to win on the PGA Tour, winning the 2007 Bob Hope Chrysler Classic in a playoff. All-America selections: Jeremy Anderson and Bill Lunde, 2nd Team; Chris Berry and Charley Hoffman, honorable mention.